My last day in Nome was packed and I wanted it to be because I wanted to get the most out of this great town before I left. We were all pleased to see Dan Seavey arrive in great shape. Dan ran the Iditarod this time to commemorate the one hundredth anniversary of the Historical Iditarod Trail. He stopped at numerous villages along the way to make presentations of commemorative plaques to the communities and talk about the history of the trail, so this was no race for him. I met Dan a number of times along the trail. 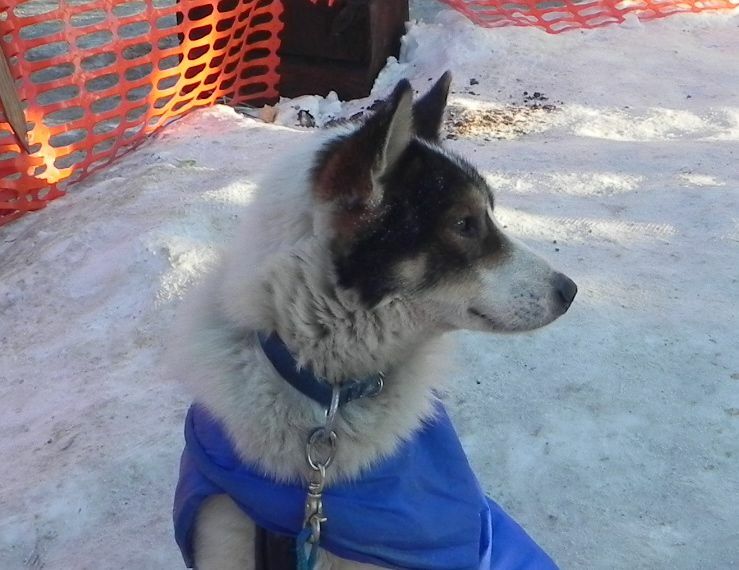 I met him in Skwentna, Takotna and Galena. In Skwentna we discussed the value of the race as an educational focus. He was surprised, but pleased to find out that his granddaughter, teaching in the lower 48, said her students responded with an amazing involvement in their academic tasks when these tasks were put in the context of the race. They found new value in math, science, geography and used an understanding of statistics to track their favorite mushers. We also discussed the values lessons available in a real life situation that the Iditarod offers. The big deal of the day, of course, was the banquet. I couldn’t believe how many people packed themselves into the Recreation Center, but I could see why. All the mushers that had finished (that was all but two) were introduced, given their trophies and buckles and the special awards were announced. My favorite every year is the Leonard Seppala Humanitarian Award, which is given for the best care given to the dogs by a musher. This year it went to DeeDee Jonrowe and was obviously well deserved. Another award that I was pleased to see was the Golden Clipboard, which is awarded to the best checkpoint and selected by the mushers. This year the award went to Nulato. I didn’t have the privilege of stopping in Nulato, but the checkpoints I went to must have given them a real run for their money, because they were all staffed by warm, welcoming individuals that would do anything they were allowed for you. 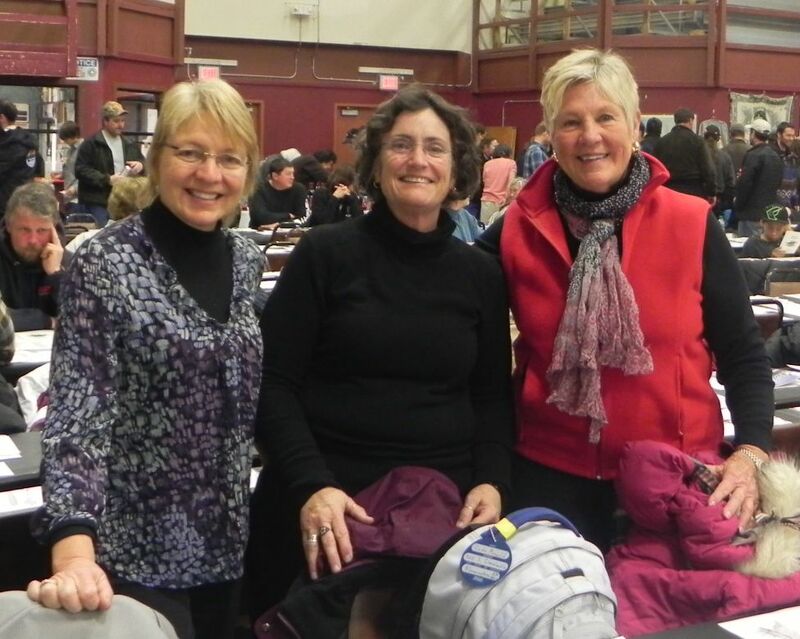 The banquet was a last opportunity for us to reconnect with people we had met along the trail and compare our experiences since we met. New stories abounded and promised to see each other again. No description of the Banquet would be complete without an applause for the food. 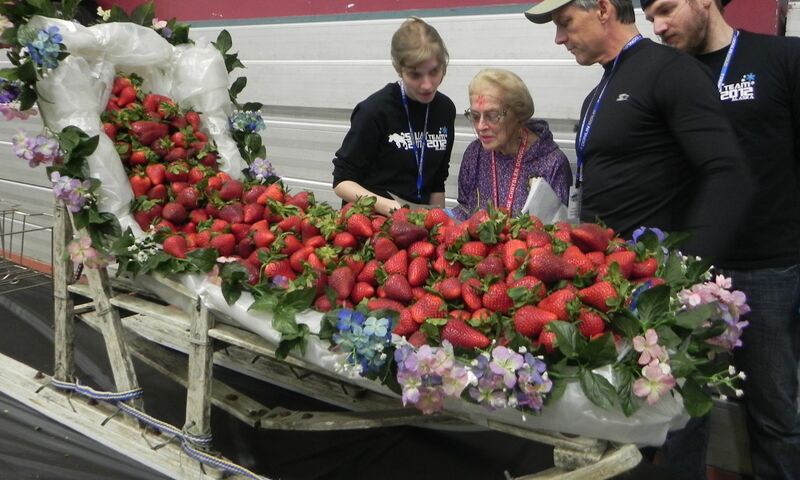 My favorite was the dogsleds filled with HUGE fresh strawberries that were constantly being refilled. That along with giant shrimp and prime rib just says it all. The volunteers were repeatedly thanked and praised by the mushers as they said this race just couldn’t happen without the volunteers and it is clear they were right, but Iditarod cares for the volunteers very well. Before the banquet they took all our bags to the airport and checked them in for us and afterward they gathered us up and whisked us off to the airport where we loaded on the plane. Being as exhausted as we all were you would have expected a quiet sleepy plane, but it was anything but as we continued to meet new people and start new relationships. By the time we were dropped at the Millennium the only thought was sleep. Rookie and I will be sad to leave this trail in Alaska, but it continues wherever you are and we will be on it.